Join the The Bonfire Texas music festival that’s “Gone to the Dogs!” (All Border Collie Rescue and Houston Pets Alive – dog rescues that is!) hosted at the beautiful Blisswood Bed & Breakfast authentic Texas-sized ranch. Rain or shine – we are hosting The Bonfire Texas under the Big Show Barn, and bonfire with the Cat Spring Volunteer Fire Department will be right outside, never have to leave the comfort of the covered barn to see the big bonfire! We are raising money for All Border Collie Rescue and Fosters of Blisswood – come out and support and meet some of the beautiful dogs available for adoption! 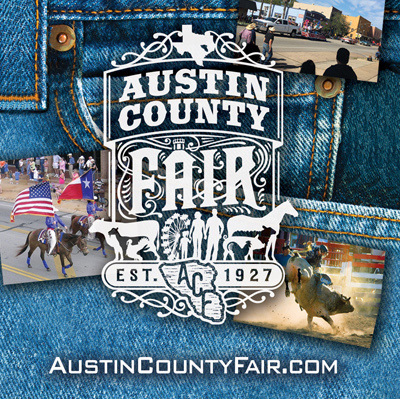 Austin County Fair & Rodeo!